USD/JPY dropped as the Fed went dovish but never went too far. US GDP, housing figures, and more events could rock the boat. The technical picture is bearish for the pair. Experts are bearish in the short term. The Federal Reserve took another dovish twist. After pledging patience in January, the Fed slashed its interest rate forecast to no hikes in 2019. Chair Jerome Powell added that the current data does not suggest where the next move could be, opening the door to a rate cut. The announcement sent the US Dollar diving across the board, and even the safe-haven yen enjoyed it. The safe-haven yen also rose on the Brexit drama. UK PM Theresa May was unable to submit the Brexit accord to a third vote and blamed MPs. She eventually asked for a short delay to Brexit, until June 30th but the EU approved only until May 22nd, assuming Parliament approves it by April 12th. If not, it’s either a hard Brexit or a long extension. Markets did not like the uncertainty and the growing fear that May will opt for a hard-Brexit. On the trade front, there were reports that China is backtracking on previous commitments and this weighed on the mood. President Donald Trump publicly said that talks are going very well, but that tariffs will likely stay. On the other hand, he reportedly wants China to buy more US goods, something that will be easy to achieve. The key sticking points are Intellectual Property and the forced transfer of knowledge. China is willing to open its purse, but not make structural changes. US data was mixed, with factory orders rising by only 0.1%, while the Philly Fed Manufacturing PMI jumping to 13.7 points. The Bank of Japan’s Meeting Minutes did not offer any news. The Tokyo-based institution remains very dovish. The US calendar is jam-packed with activities. The week kicks off with a speech by the FOMC’s Patrick Harker and continues with his peer Eric Rosengren. Building permits, housing starts, and the S&P Case Shiller HPI are of interest on Tuesday. The housing sector has shown some signs of recovery. The Conference Board’s Consumer Confidence is set to remain on the high ground in March. Wednesday features the trade balance report which is politically-sensitive given the ongoing negotiations between the US and China. 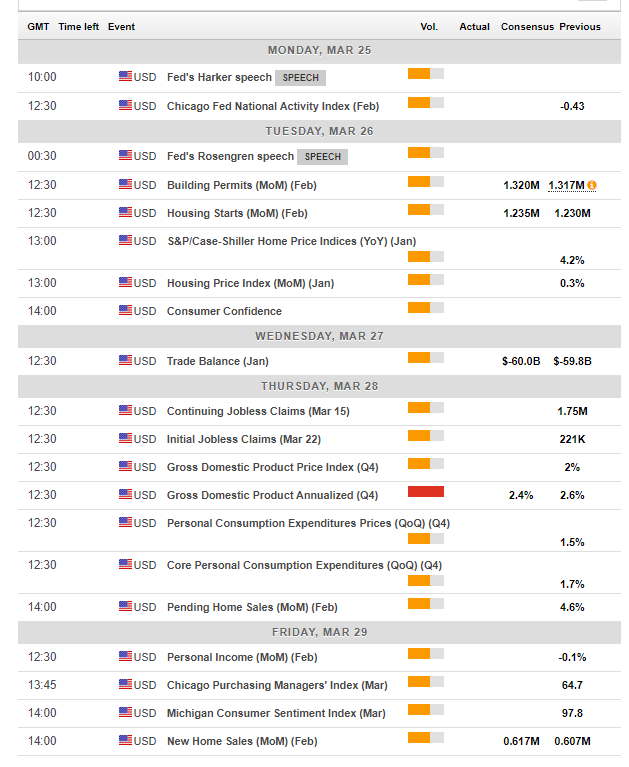 Thursday is a busy day with the final GDP reading for the US for Q1. The first report was published late due to the government shutdown and came out better than expected with 2.6%. A small downgrade is due now due to disappointing data. Any significant change will rock the US dollar. This is the most significant publication of the week. Friday sees the Fed’s preferred measure of inflation, the Core PCE Price Index. Also, personal income and personal spending are of interest. The last word of the week is reserved for the housing sector. New home sales are expected to remain stable after recovering from the lows. Apart from the flow of data, headlines related to trade are eyed. US Treasury Secretary Steven Mnuchin and US Trade Representative Robert Lighthizer will travel to Beijing for high-level talks. Any reports or tweets from Trump will be of interest. Speaking of Trump, speculation mounts in Washington about the Mueller investigation. The Special Counsel may publish his report on the alleged involvement of Russia in the 2016 elections. Among Japanese events, the inflation data for the Tokyo region stands out. It is early data for March and comes ahead of the national figures. The most significant data point is the measure of excluding fresh food, which reached 1.1% YoY in February. This is an improvement, but still below the elusive 2% target. Besides, it is important to note that the fiscal year ends in Japan and portfolio managers rush to balance their books. 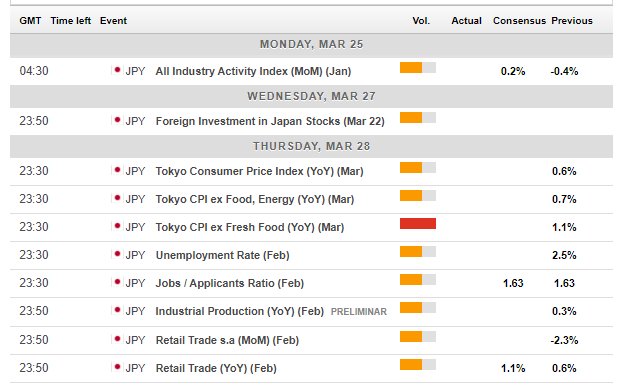 Choppy movements in USD/JPY are not rare during this week. Sentiment affects the yen, with trade talks discussed earlier playing a significant role: progress is set to weigh on the Japanese currency while a worsening atmosphere is due to boost JPY. The same goes for Brexit: if the prospects for a no-deal Brexit rise, the safe haven yen will likely enjoy higher demand. Hopes for a second referendum can push the pair higher. Dollar/yen fell out of the uptrend channel it traded in since early in the year. 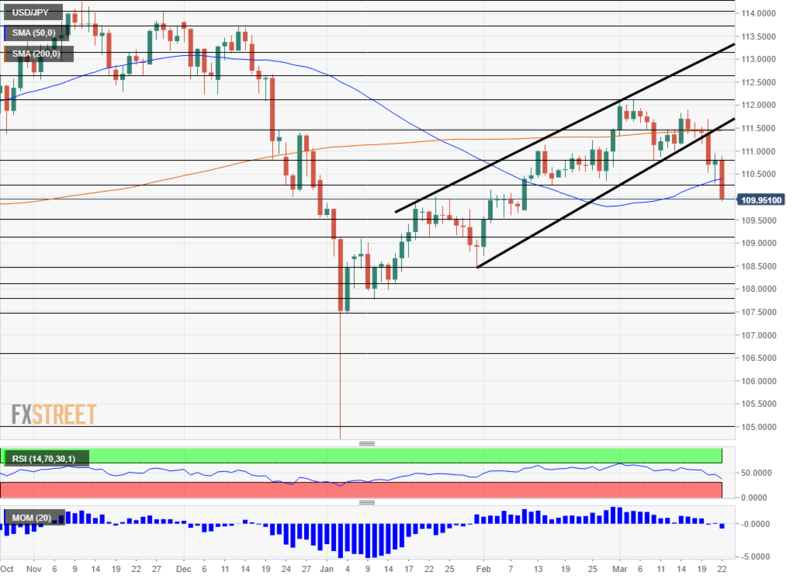 The pair is trading just below the 50-day Simple Moving Average which comes out around 110.30 at the time of writing. Momentum turned down and the Relative Strength Index is also leaning lower. All in all, the picture turned from slightly bullish to bearish for the pair. 109.50 is the next significant support line after providing some support early last month. 109.10 was a support line in January, and 108.50 was a swing low in late January. 110.30 was a support line in February and should be noted. 110.80 provided support in early March and is fought over now. 111.50 is where the 200-day SMA meets the price. 112.15 was the high point in March. The next lines date back to 113.15 and 113.70. The global economy keeps slowing down. While stocks rallied on the Fed’s dovish stance, the shift represents worries and worries could send stocks and USD/JPY lower. Adding a downgrade to US GDP and ongoing uncertainty on trade and Brexit, another slide is due. 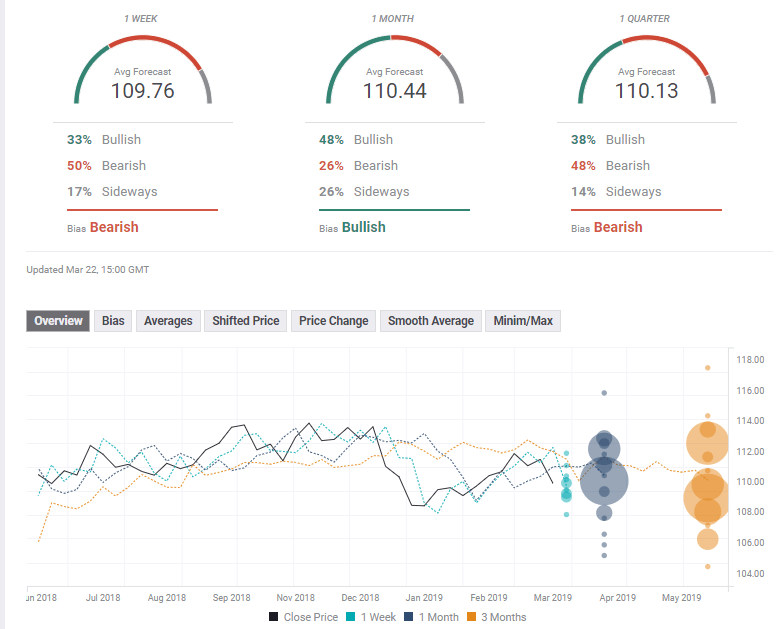 The FXStreet Poll a bearish trend in the short term, a bullish one in the medium term and a bearish one once again later on. The average targets have hardly changed in the past week. Are forecasters too accustomed to low volatility?